A sweet Hendricks County tradition returns Saturday, Feb. 28 and Saturday, March 7 when Hendricks County Parks and Recreation hosts its fifth annual Maple Sirup Days at McCloud Nature Park, just outside of North Salem. Maple Sirup Days is a hands-on, interactive experience where kids and grown-ups alike learn how maple sirup is made, all the way from the tree to the bottle that you pour over your pancakes. Naturalists at McCloud Nature Park have tapped a number of sugar maple trees -- known as the Sugar Bush -- on the property and as daytime temperatures rise, the sap from the trees is collected into buckets. The sap is then placed in an evaporator, and maple sugaring -- the process during which tree sap is collected and boiled into maple sirup -- begins. Before you call Visit Hendricks County to scream at my editor and make him cry because he didn&apos;t correct my spelling, know that "sirup" is the way "syrup" used to be spelled, designating it as being pure without any sugar added. 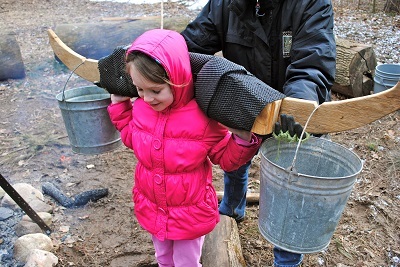 Maple Sirup Days provide an opportunity to take self-guided tours at McCloud Nature Park, learning about how Native Americans made sirup, how colonial Americans advanced the process, how to tap a maple tree, how sap is drawn from the trees and how that sap is turned into delicious sirup. Once you learn everything there is to know about sirup, make sure you sample and then purchase a bottle or three of 100 percent pure McCloud Maple Sirup. All proceeds benefit Hendricks County Parks, so it&apos;s a win-win situation. Can&apos;t wait to take your new bottle (or four) of McCloud Maple Sirup home and whip up some pancakes? There&apos;s no need to suffer! On both Maple Sirup Days, from 8 a.m. to 3 p.m., McCloud Nature Park is also hosting its 7th annual Pancake Breakfast Fundraiser in the Nature Center, serving all the pancakes you can eat (topped with McCloud Maple Sirup, of course!) in exchange for freewill donations. As with the purchase of McCloud Maple Sirup, all proceeds raised at the pancake breakfast benefit Hendricks County Parks Foundation. In past years, the pancake breakfast has only been held on one of the Maple Sirup Days, but because this is such an outrageously popular event, Hendricks County Parks and Recreation has expanded it to both days. Superintendent William Roche told me that on March 7, the pancake breakfast will be run by the recently-created Youth Advisory Board -- kids from every Hendricks County school corporation who provide insight and input into Hendricks County parks programs. He also said that people are seated every 45 minutes during the pancake breakfast, but seating inside the Nature Center is limited, and it fills up very quickly, so he highly recommends calling (317) 718-6188 to reserve your spot at the table. Wear boots and clothes that you don&apos;t mind getting dirty. Naturalists put straw down for people to walk on, but it&apos;s late winter in Indiana, and mud happens. Dress warmly, including hats and gloves. One portion of the self-guided tour is indoors, but most of it is outdoors. With the way this winter is going, it might be 70 degrees or it might be -10 degrees outside when you head out to McCloud Nature Park. Last year was a bit windy when I was there, and I was unprepared for that, so learn from my mistake and pack warm stuff for you and the kiddos to wear. Start your tour inside the Nature Center. It doesn&apos;t make all that much difference, but the tour will flow in a more logical way if you start at the Nature Center. Call (317) 718-6188 to make reservations for the pancake breakfast. Nothing&apos;s worse than smelling those &apos;cakes and having no room at the table to enjoy them. 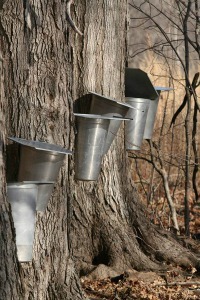 Come on out McCloud Nature Park on Feb. 28 or March 7 for Maple Sirup Days! Enjoy some family time, learn some interesting stuff, snag a bottle or five of McCloud Maple Sirup, fill your belly and support Hendricks County parks.